Please use the information on this website appropriately and recognise that it deals with medical history only. You should not use this website as a source of advice about modern anaesthesia or medicine – such advice should be sought from a suitably qualified professional. Commentary and other materials posted on the website are not intended to amount to advice on which reliance should be placed. We disclaim all liability and responsibility arising from any reliance placed on such materials by any visitor to the website, or by anyone who may be informed of any of its contents. 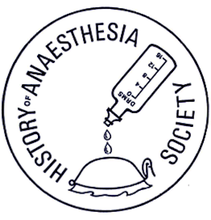 The History of Anaesthesia Society has made reasonable efforts to obtain permission (where necessary) to use the images and embedded videos on the website and, so far as the Society is aware (and to the best of its knowledge) all of the images and videos have been cleared for such use. The Society requests that any owners of copyright in the images and videos who have not been properly identified or credited contact the webmaster so that we may consider making the appropriate corrections.